“The saving of a life often depends on the quickness with which the person whom life is in danger can be transferred to a hospital where the best scientific surgical and medical attention may be given. And right here is where the automobile ambulance plays an important part. The speed that has been made by this mode of conveyance of injured persons from a distant point of accident to the hospital is remarkable. It is done with the utmost care and with comfort to the patient. It is being done right here in Newark by the auto-ambulance of the City Hospital, which the Board of Health recently added to the equipment of that institution. The City Hospital handles upward of two thousand emergency cases a year, and an average of one hundred and eighty cases a month. It used at times to keep the old horse-drawn ambulance busy almost every minute to keep up with the large number of calls from all parts of the city, and Newark is by no means a small city any longer. Besides, it is a business and manufacturing city representing nearly all the industries mentionable. It must be remembered too that these factories are situated in widely different parts of Newark. This means that if any accidents occur in two or more of these plants within a few minutes of each other there are several persons injured at the same time, and one ambulance certainly cannot cover tow cases simultaneously. It takes the horse-drawn vehicle an hour to do what the motor conveyance will do in ten and fifteen minutes. For instance, it used to take the old ambulance a half hour and three-quarters of an hour to go to the Pennsylvania Railroad depot, on Market street, and return, and sometimes longer. The motor ambulance will make the same trip, allowing time for the placing of the patient in the vehicle, in from nine to eleven minutes. The man in the white uniform who sits in the rear of the ambulance was taught long, long ago that while there is life there’s hope, and this is always uppermost in his mind when he is being driven to a point of accident. He doesn’t know what the accident is or how badly the person or persons may be injured. The ambulance surgeon’s training is such that at a glance he can form an idea of just how much life there is in the person injured. He can estimate closely in a twinkling the chances of reviving the sufferer. If there is any life at all he is alert to use his skill. He will do as much as he can at the scene of accident, but if there is a possibility of doing more effective work at the hospital there the patient is taken with all possible speed. The records show that more cases have been saved in treatment at the hospital than outside of it. When the girl who sits like a sentinel at the switchboard in the office of the City Hospital receives a “hurry call” over the phone, she swiftly transmits the message to the “man in white” who is on duty in the receiving room of the hospital. At the same time the operator rings up the stable and informs the ambulance driver. By the time the surgeon reaches the stable the auto-ambulance is ready, and in less time than it takes to tell it like a streak of lightening, they’re off to the scene of trouble. That’s motor power for you. But if it was the horse-drawn ambulance, it would take much more time than that, and oftentimes the surgeon would arrive at the stable long before the horse could be hitched up, though barring the automobile very rapid work has been done with the old horse-ambulance. No fault was ever found with it, but the march of invention has overtaken it, and like other things, it must give way to up-to-date methods. After the victim of any mishap is picked up by the ambulance and hurried to the hospital, the person injured is taken to the receiving room. This room is in the basement of the big building. The patient is carried in on a stretcher by two orderlies and the ambulance driver and is transferred to a rolling stretcher. If it is a male patient the orderly rolls the stretcher into a white curtained booth and begins removing the clothing while the internes go to work on the injured one. Everything that can be ascertained about the patient’s identity by the doctor is learned and then recorded in a book. After the surgeon’s completes their work in the receiving room the patient is removed to one of the wards in the upper part of the building. Here he is given all the attention the case requires, with a regularity and system that cannot be equaled outside of a hospital. “At the time of the Bergen Street Public School scare, when we got a report that the roof of the schoolhouse had collapsed.” continued Dr. Talbot, “we had a ward and part of another prepared to receive the injured in less than ten minutes. At that time we only had our horse-drawn ambulances, and as soon as the operator got the report of the supposed accident both of the vehicles were dispatched post haste. “Since we have received the auto-ambulance the emergency service has been enhanced greatly. We are always ready to meet any unexpected occurrence in our field of work. Preparedness is our watch-word.” Dr. Talbot concluded. The value of the automobile ambulance was demonstrated one day last week when a reporter for the Sunday Call paid a visit to the institution. A hurry call was received in the stable. The chauffeur cranked up his machine, at the same time shouting to the ambulance surgeon: “Hurry call, Doctor! Hurry call” Summer avenue and May street” The “man in white” jotted it down on his report blank, and noting the time of leaving, the big machine shot out of the building and sped down the street. Looking out of the stable door, the only thing visible was a trail of dust left behind. While Dr. Talbot and the reporter were still engaged in conversation they begun when the ambulance left the machine chugged up in front of the door. The doctor reported that a man had been slightly injured by a fall and refused to go to the hospital. That trip covered a distance of nearly seven miles and the auto ambulance did it in less than twenty-two minutes. Not long ago, when the motor ambulance was put into service, the hospital received a call from Elm road, which is to the extreme eastern end of the city. The vehicle made the journey to and from in twenty-three minutes”. 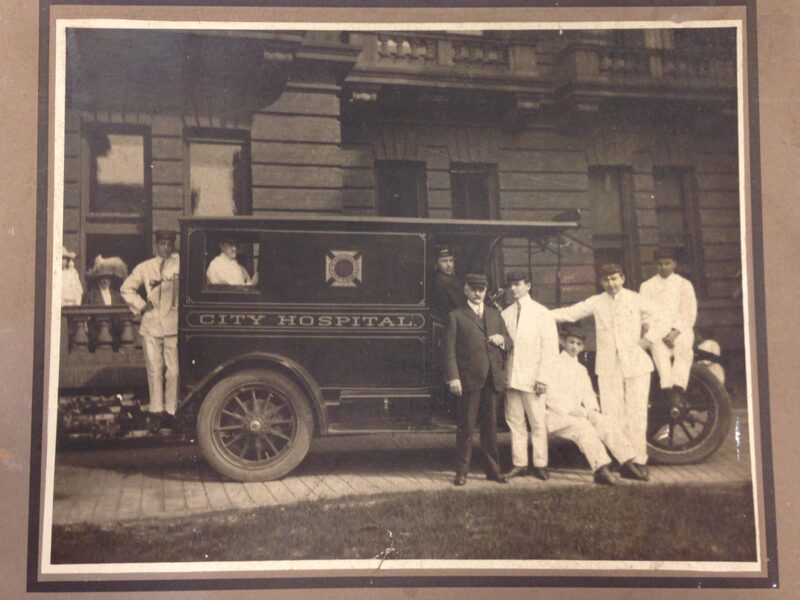 The Newark Board of Health purchased a second auto ambulance in January 1913. This new ambulance is the subject of the group photo shown above.